Peru and the Amazones Country. 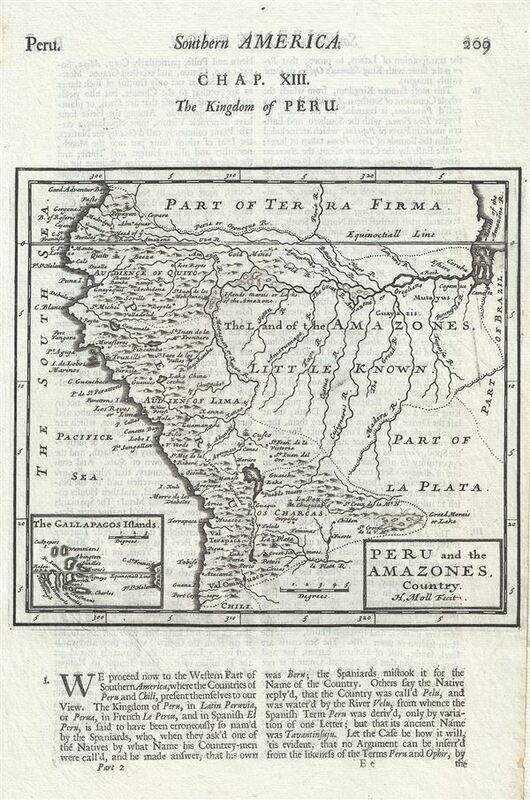 This is a fine 1701 map of Peru, Bolivia, Brazil and Ecuador by Herman Moll. It covers the western parts of South America from the mouth of the Amazon south to Chile. Includes the modern day nations of Peru, Ecuador (here called Quito), Bolivia, and parts of adjacent Brazil, Columbia, Chile and Argentina. Though by this point in history, the general outlines of South America are well established by regular circumnavigations of the continent, the interior is entirely speculative. Moll fairly accurately maps of the Amazon and Orinoco River systems, though he does erroneously connects the two, an understandable error common to maps of the period. The map notes several towns cities , lakes and rivers throughout, with beautifully rendered mountain ranges. An inset in the lower left quadrant depicts the Galapagos Islands. This map was issued in Herman Moll's 1701 System of Geography. Herman Moll (1654 - 1732) was an important 18th century map publisher and engraver based in London and Holland. Moll's origins are disputed with some suggesting he was born in the Netherlands and others Germany - the Moll name was common in both countries during this period. Most likely Moll was a German from Bremen, as his will, friends, and contemporaries suggest. What is known for certain is that he moved to London in 1678, possibly fleeing the Scanian War, where he worked as an engraver for Moses Pitt and other London map publishers. Around the turn of the century, Moll set up his own shop where he produced a large corpus of work known for its high quality and decorative flair. As a new émigré to England, Moll made himself more English than the English, and through his cartography proved a fierce advocate for his adopted nation. Most of Moll's early maps were issued as loose sheets that would be bound to order, however, he did publish several important atlases late in his career. Moll is said to have made the bold claim that without a doubt "California is an Island" and that he "had in [his] office mariners who have sailed round it." While California may not be an island (yet), it is true that moll had talent for attracting interesting friends and acquaintances. He frequented London's first stock exchange, Jonathan's Coffeehouse at Number 20 Exchange Alley, Cornhill. At the time Jonathan's was known as "a place of very considerable concourse for Merchants, sea faring Men and other traders" (Erleigh, The Viscount, The South Sea Bubble, Manchester: Peter Davies, Ltd., 1933, 21). Eventually this activity attracted the interest of stock brokers, who inspired by sailor's tales, sponsored the ill-fated South Sea Company, the world's first stock bubble. Moll's close circle, mostly from the Coffee House, included scientist Robert Hooke, the writers Daniel Defoe (Robinson Crusoe) and Jonathan Swift (Gulliver's Travels), the pirates William Dampier, William Hacke and Woodes Rogers, and the archeologist William Stukeley. Herman Moll's work was highly regarded for its decorative beauty and was pirated, most notably by the Irish publisher George Grierson, both in his lifetime and after his 1732 death at St. Clement Danes, London. Moll, H., A System of Geography: Or, A New and Accurate Description of the Earth In all its Empires, Kingdoms and States (London), 1701. Herman Moll's A System of Geography was first published in 1701. A System of Geography was essentially a larger version of Timothy Childe and Abel Swall's 1695 Thesaurus Geographicus, for which Moll engraved several maps. The enormous success of the Thesaurus Geographicus most likely provided the inspiration for Moll to publish a more complete atlas of his own, which finally resolved into the 1701 issue of A System of Geography. The additional maps included in A System of Geography were stamped 'New' to distinguish them from those rolled over from the Thesaurus. A System of Geography was issued in two parts containing numerous maps as well as extensive descriptive text. It was printed in London by both Timothy Childe and J. Churchill. Very good. Original platemark visible. Minor spotting. Text on verso.